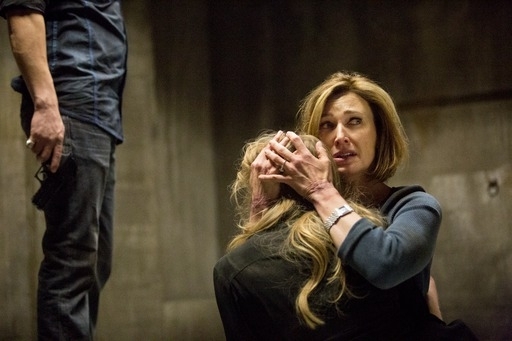 Will Ann and Emma both make it out alive from their ordeal? Feuds are set aside as the Ewings and Rylands find themselves at the mercy of the Mendes Ochoa cartel, who are holding Emma and Ann hostage. Bobby and Christopher arrive at the Rylands’ home to let them know the cartel has seized control of Ewing Global and Harris tells them about the kidnapping. Judith tries to hold it together while talking to the cartel head Luis but falls apart at the thought that she might lose her precious Emma. Ann excuses herself to go to the bathroom and sees some cartel goons loading up a truck with dead bodies. These guys mean business, she realizes. The full picture of horror becomes even more apparent after Luis gets an upsetting call about Ryland trucks getting intercepted at the border and he pulls a gun on Emma, firing a shot to scare the daylights out of the Rylands on the other end of cellphone call and a hysterical Ann. The next time will be for real, he warns them. Running into roadblocks with the CIA and learning that Nicolas is selling Ewing Global assets on the cheap to funnel capital to the cartel, the Ewings escalate their strategies to free Emma and Ann. Bobby pulls some political strings to get the Texas railroad commission to stage a phony security exercise to distract the border patrol to allow the next cartel shipment to get through to the U.S. Sue Ellen warns him that his gambit could earn him a life sentence in jail. It would be worth it just to save Ann and Emma, Bobby responds. John Ross, meanwhile, turns to Pamela for help in his plan to enlist the help of the Sheik to pay off the cartel to win Ann and Emma’s freedom. Pamela couldn’t care less about him and Emma, but concedes she would do anything to help Ann. She and John Ross visit the Sheik’s son Nassar and, after ganging up on her husband with the oil heir, Pamela succeeds in enlisting the Sheik’s help. It doesn’t hurt that John Ross’ wife is so savvy and charming, Nassar volunteers. Young Mr. Ewing might do well to remember this fact the next time he’s tempted to stray. Pamela is determined to reclaim the shares of Barnes Global that John Ross lost to Nicolas and the cartel. Nicolas has his hands full juggling his lies to his wife and mistress. He confesses to Elena the truth of how he was indebted to the cartel for a loan they gave him to pay off a corrupt benefactor he had back in Mexico. 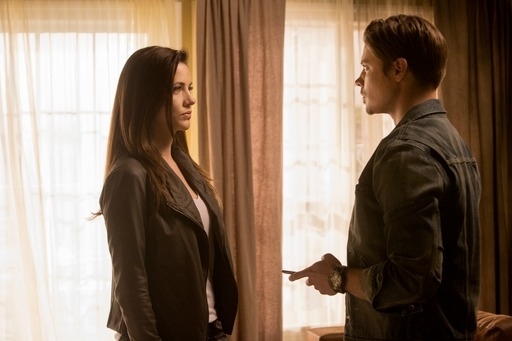 Elena wants to tell the Ewings all about Nicolas’ deceit. Mrs. Trevino, meanwhile, gets another visit from Christopher seeking her help in tracking down Nicolas and Elena. It isn’t until one of her henchmen shows her photos of the lovers on the lam that Lucia decides to tell Chris where to find his ex and her duplicitous latin lover. At the cartel hideout, Bobby arrives to bargain for Emma and Ann’s release with his Texas railroad commission plan. A train will do a much better job of transporting the cartel’s product over the border than the Ryland trucks, Bobby points out to Luis. The cartel honcho accepts Bobby’s deal but drops the bomb that he can only leave with one of the hostages! Does Bobby have a King Solomon moment ahead of him? Stay tuned for next week’s two-hour season finale!